For the last five years, I have been using my background in molecular biology, fine art, and interaction design to create works about climate change and sustainability through The Apocalypse Project, an artistic body of work created as a response to Typhoon Haiyan devastating the southern part of my native Philippines. Since then, I have observed how the discourse has evolved to cover what climate change was, to the reasons why it was happening, to the broken systems in society that caused it. I have been given many opportunities by institutions to work with local communities and ecosystems. My residency and fellowship experiences especially in Southeast Asia, Colombia, Uganda, and the Amazon have made it clear to me that researchers were right: the people who are most affected by climate change were the ones who had done the least to cause it. The role of an artist gave me the freedom to develop relationships and collaborate with people that I had previously only read about and to bring their stories to a wider audience. Furthermore, it became possible for me to connect the Global North and South through these works. Events such as Brexit and the inauguration of Donald Trump as the 45th president of the United States rocked the scientific community. The latter resulted in the appointment of climate change deniers in key positions, the repealing of environmental regulations, and the perpetuation of hoaxes. “Post-truth”, which was first used in 1992, was named Word of the Year by Oxford Dictionary in 2016. Some of my favorite collaborators and colleagues through the years have been researchers, especially those at the forefront of sustainability research, be it in the physical or social sciences. It has always been a privilege to look into the world of scientists and have enlightening conversations about the possibilities of our fields. What has also been illuminating is hearing about how people have had less trust in and access to science. 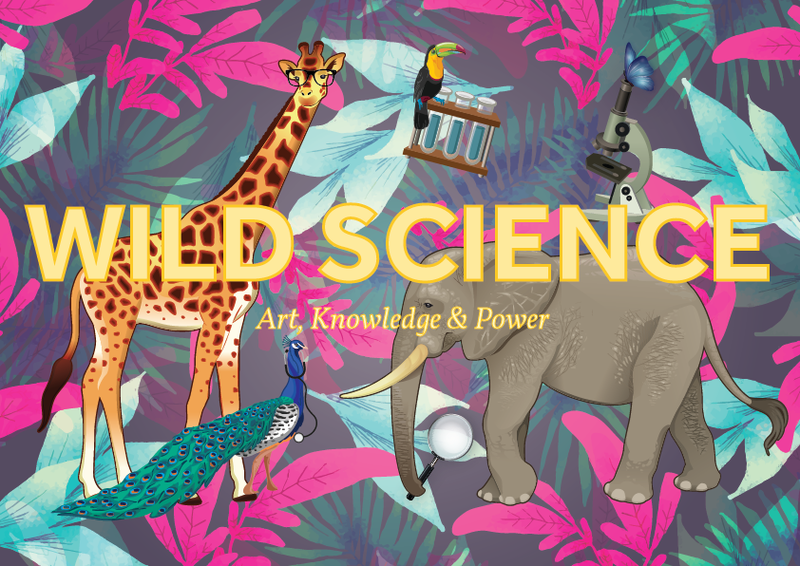 From funding cuts in museums and education to science denialists everywhere, I believe that science is under attack, and this new artistic body of work, Wild Science, seeks to understand the dynamics between knowledge and power. In Bartholomeus Spranger’s painting, Minerva victorious over ignorance (1591) hanging in the Kunsthistoriches Museum in Vienna, the goddess of art and science is dressed for battle and conquers the donkey-eared ignorance. In a world of fake news, filter bubbles, and the failure of science to sufficiently impact public policy, this painting is not just a classical allegory, but also a contemporary aspirational ideal. Today, science has become a battleground, where facts are rejected and scientists are denounced as frauds. When society is under stress, artists get to work. I am truly excited to begin this thread in my artistic practice. In addition to The Apocalypse Project, which focuses on climate change and its various effects around the world, both present and future, Wild Science examines the relationships between science and society by investigating the history and process of creating, revising, and distributing knowledge, as well as how it is being put to use. The primarily interactive works interrogate the place of science in the modern world, and the role of art in mediating between science and the public. I cannot think of a better place to do this than in Vienna, the stomping grounds of many an artist and scientist and where I am beginning this work as an artist-in-residence. It is interesting to think about science denialists in the context of Vienna’s rich history of science. To a visitor like myself, each century-plus-old museum seems like an antidote to the many ailments that plague modern society. Are you a flat earther? The Globe Museum should fix that. Do you not believe in evolution? A few visits to the Natural History Museum are in order. Are you in doubts about climate change? Come visit the animals in the Tiergarten! There are so many places in Vienna that seem fit to handle every sort of denial or confusion. During my residency, it has been a joy to go through all of these institutions, some of them multiple times, as many things needed a second, third, or even fourth look, and to be inspired by the discoveries of the past and how knowledge needs revisiting. Being equally passionate about art and science, I use my interdisciplinary background to create works that inspire conversation. I also believe that art can transcend social norms. Artists, being people who can move freely and unhindered between all social classes and disciplines, can be conduits between and among these people and promote the change that society wants. The growing disenfranchisement of many communities worldwide as a consequence of wealth inequality will likely increase distrust in scientific institutions. Artists in residencies, be it in laboratories, rainforests, or on castle grounds, have the unique opportunity of treating everyone equally and mingling through all social classes and disciplines, and so can become key bridges that connect these different camps and provide engaging avenues of common ground that seek to be inclusive and diverse. Another reason for distrust is our human penchant for motivated reasoning, where we respond to stories that affirm our pre-existing beliefs. Artists can help scientists because our field appeals to human emotions and can thus help persuade people of the veracity of science. Human beings are both rational and imaginative; for reason to triumph, science needs to engage with emotion. Art and science need each other, so let’s get to work. 1. Bethiany S., Dakos V., Scheffer M, Lenton T M. “Climate models predict increasing temperature variability in poor countries,” Science Advances 4, no. 5 (2018). Accessed May 26, 2018. http://advances.sciencemag.org/content/4/5/eaar5809. 2. Flood, A. “ ‘Post-truth’ named word of the year by Oxford Dictionaries,” The Guardian, November 15, 2016. https://www.theguardian.com/books/2016/ nov/15/post-truth-named-word-of-the-year-by-oxford-dictionaries. 3. Gross, M. “The dangers of a post-truth world,” Current Biology 27, no. 1 (2017): R1-R4. Accessed 26 May 2018. https://doi.org/10.1016/j.cub.2016.12.034. 4. “Post Brexit, experts need to reassert their value to society,” New Scientist, 29 June 2016. Accessed May 26, 2018. https://www.newscientist.com/article/mg23130803-500-post-brexit-experts-need-to-reassert-their-value-to-society.